I believe, and I only say ‘believe’ because I am somewhat uncertain, that casserole is or has neared the end in our beautiful state of Wisconsin. Just like the seasons, it is one of the things I think we all love. You know when you start new recipes based entirely on the weather. As it was cold and rainy a few weeks back, I decided to once again review the contents of the freezer, cupboards, and pantry, and come up with something for dinner. I’m so glad I did, and as surprised as I was (and probably should not have been) this entire casserole was devoured by just three of us. Please don’t judge us on a rainy, cold day. 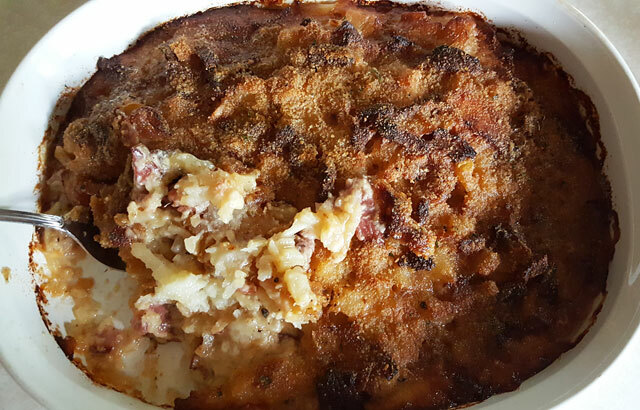 This casserole is definitely not pretty, but my oh my is it ever comforting and delicious. Told you it’s not pretty. Start by heating a large skillet on medium heat. Add in the canola oil, and once heated through, add in the hashbrowns, and gently push down, as well as push in the edges a bit to form a nice potato patty. Let these cook somewhat low and slow. The goal is to get them nice and crispy on the outside while keeping them nice and tender on the inside. Granted these will be mixed and baked but the texture is nice at the end. During this time, let’s make the cheese sauce, or mornay sauce if you will. It’s your standard bechamel in a way but with cheese added. To a sauce pan, melt the butter. Once melted, stir in the flour, and cook out the flour on medium heat for a couple of minutes. Stir until it forms a bit of a paste, yet doesn’t turn color on you. Slowly pour in the milk, continuing to stir and breaking up the flour to create your sauce. Once all of the milk is added, season with a bit of salt and pepper. You’ve been keeping an eye on those hash browns, right? Good. Now give them a flip, reform them into a patty, and continue to lightly crisp on the other side. Once the sauce begins to thicken a bit, reduce the heat, and slowly add in about 3/4 of the cheese, reserving a bit to finish during baking. Get a large bowl out to mix everything. Add in the crisp hash browns, top with the ham, then pour over the cheese sauce. 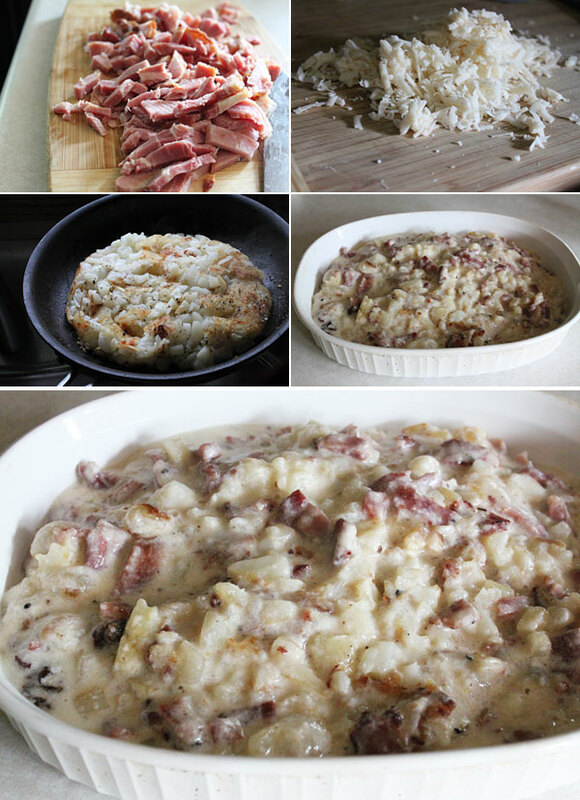 Give this a good mix, breaking up the hash browns to your desire, then pour into a casserole dish. Top with remaining shredded cheese, and lightly shower on the bread crumbs. Place into the preheated oven and cook for about 25 minutes or until the top is nice and golden brown. Remove from the heat, let cool for about 5-10 minutes, then scoop into a bowl and dig in. Talk about comfort food. Two of my kids were out for the evening so I thought it would be just my wife and I in front of the television watching LaLa Land (sigh), but then one of my picky eaters (doesn’t like melted cheese on most if not all foods) comes in with a bowl (and then helped himself to thirds) and we all could not stop eating this stuff. We finished the casserole. Yep, this one is that good. If you are looking for an easy casserole to make, and have a few things lying around in your freezer and pantry, give this one a shot. Until the fall season starts, this one will have to wait. Sorry, ham, cheese, and potato casserole, but you will be missed!